Suzan Harjo did a great job of sharing, from a very personal perspective, important history that often does not appear in textbooks[...]. It was all very informative and eye-opening. She is a warm and charming person, and students enjoyed having an opportunity to talk with her informally to get her viewpoints on a variety of issues. She has developed key laws in five decades to promote and protect Native nations, sovereignty, children, arts, cultures and languages, including the American Indian Religious Freedom Act, National Museum of the American Indian Act and Native American Graves Protection and Repatriation Act. Dr. Harjo is the first Native woman to receive an Honorary Doctorate of Humanities from the Institute of American Indian Arts (2011), the first Vine Deloria, Jr., Distinguished Indigenous Scholar (University of Arizona, 2008; and a 2013 Deloria Lecturer), the first person to be awarded back-to-back fellowships by the School of Advanced Research (in Poetry and as a Summer Scholar, 2004) and the first Native woman to be honored as a Montgomery Fellow (Dartmouth College, 1992). 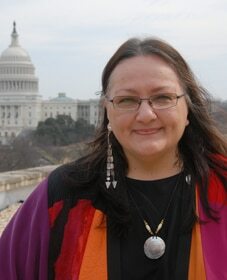 Past Executive Director of the National Congress of American Indians, she served as Legislative Liaison for the Native American Rights Fund and in the Carter Administration, and was lead plaintiff in Harjo et al v. Pro Football, Inc. (1992-2009), the landmark lawsuit against the disparaging name of the Washington professional football franchise. A Founding Trustee of the National Museum of the American Indian, she is Guest Curator and General Editor of NMAI’s “Treaties: Great Nations In Their Own Words” (opening and publication, 2014) and an award-winning Columnist for Indian Country Today Media Network.